Click on events above for more details and to add to your personal calendar. The next Hatch PTO Meeting is April 16th! Ms. Mendez will discuss key events and activities occurring during the last few weeks of school. We'll also review the PTO budget for next year and announce PTO Board candidates. All are welcome Tuesday, April 16th from 7-8 p.m. in the Library. Free childcare is provided in the lunch room to help parents attend. An agenda for the upcoming can be found here. The PTO needs volunteers for the 2019-20 school year. Please consider volunteering to Chair one of the open positions. Our students count on parent volunteers to keep all of the wonderful PTO sponsored events up and running. All money raised by the PTO goes right back to our students in the form of discounted field trips, special assemblies, additional programming, various remodeling projects, and many other funding requests. Email Beth Sauers at beth_sauers@yahoo.com if your are interested or have questions. For more details on the available positions please click here. This year's Spring Book Fair will be held April 23rd-25th. There’s sure to be something for all readers. With summer around the corner the Spring Book Fair is the perfect time to purchase summer reading materials. The Book Fair will hold an Ice Cream Social in the Hatch School Cafeteria on Wednesday, April 24th from 5:30 to 7pm. The Book Fair takes place after school but each student will preview the book fair during the school day and make a ‘wish list’. 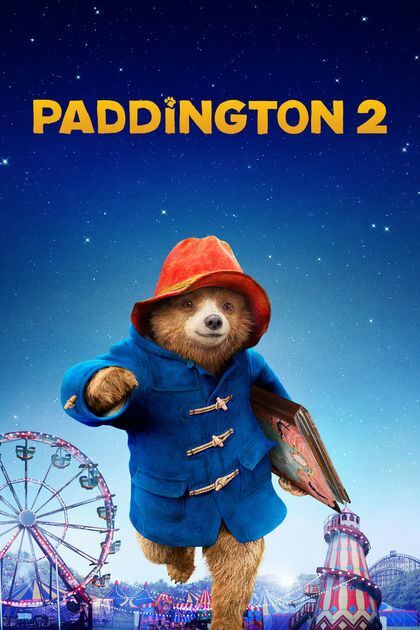 This month's movie will be Paddington 2. The movie starts at 3:15 pm. Concession sales begin 10-15 minutes beforehand. Most items (water, juice, popcorn, etc.) are $1. Admission is $2 each. Kindergartners must be accompanied by an adult or older sibling (exceptions made for Hephzibah and Apollo program participants). If you will NOT accompany your student(s), please indicate your approval to attend with this electronic permission slip. End time is approximately 4:55pm. We also need volunteers! Please click here to volunteer to work at the box office or concessions. Our cafe is a safe space to share ideas about what parents want and need to support our children in school and build strong families. It's open to all parents and families of ESL students, parents with limited English, bilingual parents, and all concerned members of the community. Eventbrite sign-up link is bit.ly/event-ParentCafe To be held at Oak Park Public Library Main Branch. For more information, please refer to this flyer. The Physical Education Department will be hosting a District 97 Adventure Run on Saturday, May 4th at Lindberg Park. The Adventure Run is free of charge and open to all Kindergarten through 5th grade students in District 97. This is a culminating event to celebrate National Physical Fitness and Sports Week. If your child wants to participate, please fill out the following form. Singing, dancing, magic, music, acting and Fun! Fun! Fun! We are looking for talented Hatch students, in grades 2-5, to participate in the 2019 Hatch School Talent Show on May 24th! If your child is interested in participating in "Hatch Has Talent," please complete the google form below and submit it by April 12th. Subscribe to our Hatch Happenings weekly newsletter to know about events, sign ups and what's happening at school. How the PTO helps Hatch! Assemblies: The PTO pays for special assemblies such as Opera for the Young that enrich your child's overall academic experience. Buses for Field Trips: The PTO funds the cost of all buses for field trips. Classroom Subscriptions: The PTO pays for classroom enrichment subscriptions such as Brain Pop & Time Magazine. Conference / PTO Meeting Babysitting: The PTO provides babysitting services during Parent / Teacher conferences and during PTO meetings as a convenience for parents and to enable both parents to attend. Hatch After Hours (HAH): An after-school enrichment program providing classes featuring fun and challenging academic, athletic and artistic activities. Oak Park Educational Foundation: The PTO supports the OPEF in providing programs that directly benefit Hatch including Architecture Adventure (part of Art curriculum) and Geared Up (part of 3rd grade Science curriculum). Teacher Reimbursements & Thank You Gifts: The PTO provides Hatch teachers a stipend for classroom materials above and beyond what is provided by the district. We also provide a teacher luncheon during conferences and an end of year gift to compensate for out of pocket expenses. Teacher Requests: The PTO sets aside a portion of its budget to fund additional teacher requests which may include instructional materials, enrichment programs and new classroom amenities that improve the overall classroom environment. These are voted on at the monthly PTO meetings. World Language: The PTO sponsors a program during which students have the opportunity to learn Spanish, German, French or Chinese two times a week during the lunch hour. Help us by participating in the Box Tops for Education program. We are also pleased to be a participant in the eScrip Program. eScrip will allow you to register your credit cards, earning Hatch 5% on all your qualified dining purchases. It works at many local restaurants like: Scratch Kitchen, Geppetto's Pizza, Fitzgerald's, and about a ba-zillion others. You can download an app to find restaurants or just go about your business as usual. When you do eat at a participating restaurant, Hatch will get the dough! Register now! Search for William Hatch School PTO when you register or use our PTO Group number: 500014921. Register now. Our school is listed as "William Hatch School". I just did it. It took about 3 minutes. It works at many local restaurants like: Scratch Kitchen, Geppetto's Pizza, Fitzgerald's, and about a ba-zillion others. The Hatch PTO offers a wide variety of benefits to the Hatch community. If you'd like, you can also donate directly from the Hatch PTO site! 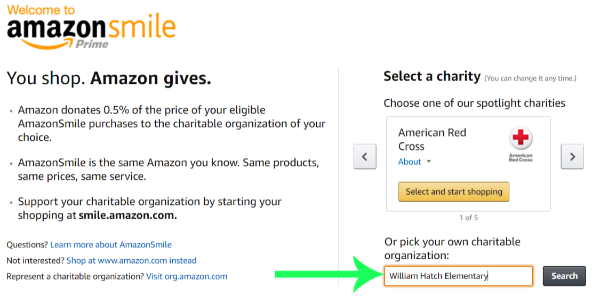 Use Amazon Smile to Access Amazon for Shopping and Support Hatch!